Slinky was not keen on being displaced as the man of the house when Brian started spending time with me, but Brian was able to win him over by taking over daily feedings. “Oh, this is the man that feeds me!” he would think. Eventually he let Brian manhandle him and play “kitty on the ceiling.” Later in his life, Slinky had a prescription filled under the name “Slinky Judd” – we joked that he also done some exotic dancing under that name. We took it as proof that he had truly adopted Brian as part of his family. During his middle age, Slinky lived in Newburyport and earned his keep by catching several mice – one he consumed, the others kept to present to us as trophies. He would drool when excited, whether that was about meeting someone new, getting scritches under his chin, or just being petted while resting on one of our shoulders. He especially loved the blue wing-back recliners, sitting on top of them to have a view of the whole room. He had to be satisfied with this view, after he’d climbed one of the exposed beams one day and we found him at eye level, which caused us to cover the posts with bubble wrap to prevent him from scratching them to pieces. He also liked to intimidate the squirrels in the back yard, staring at them through the french doors in the fireplace room (and scratching the screens, necessitating a change to plexiglass on the lower panel). Slinky was lactose intolerant but loved butter. We would leave a covered butter dish out on the counter, and come back to find the lid askew. Finally Brian asked me why I couldn’t put the lid on straight. I told him that I always straightened it, and had been wondering why he couldn’t keep the butter dish covered properly. We looked at each other, and then looked at Slinky, who was not-so-innocently licking his lips and paws. From then on, the butter dish was kept out of reach of the kitty. When we moved to Chelmsford, Slinky made himself at home, sleeping in various bedrooms but most often being found on that same blue wing-backed chair. His new nemesis was the chipmunk who would come up on the deck to partake in the grease from the grill – Slinky would scowl from safely behind the sliding glass doors. Slinky found a new favorite spot, sitting in the open window in the sun room on a warm breezy day, letting the curtains billow behind him. He was patient and hospitable in welcoming Isaac and recently Ezra to the household. He was always gentle and patient, never minding the antics of the boys, and stepping gingerly over the legos that now littered the floor. Isaac’s first word was “kT” (kitty). Slinky even allowed Ezra to grab a tuft of fur to learn about “fuzzy” and “soft” things. Over the years Slinky’s fur became more gray and his black stripes were barely visible. As he grew older he became like many old men, picky about his food and where he did his “business” but also more welcoming of new people. Instead of hiding during parties, Slinky would come out to find the person who least liked cats (especially if they were wearing a dark outfit that would show off his shedding fuzzy furr), hop up on their lap, and attempt to make a new friend. This past year, he also grew to love people food. He would sneak into the dining room and brazenly jump up on the table after we’d eaten, especially while we were upstairs getting Isaac ready for school or bedtime, to drink some milk from Isaac’s cereal bowl, lick a platter of hamburger juice, or nibble on some cheese. Though we don’t exactly know the cause of death, Slinky had not been eating and had gotten more lethargic the last few days. I took him to the vet today to see if there was anything we could do. His temperature was low and she had trouble getting a blood sample. She gave him some IV fluids to try to perk him up. His breathing was labored when we got home and he didn’t want to come out of his carrier. He passed away this afternoon sitting in a sunbeam next to his favorite blanket, with Brian and I nearby. We are comforted to know that he received extra brushing, petting, a treat, and a finger-full of butter in his last days. Arrangements are still being considered, but for now Slinky is curled up in a soft towel in a cozy cardboard box. He always did love exploring a new box. He came into my life in a box, and now is ready to depart in one. Rest in peace little furry friend. A gallery of photos can be found here. Posted by susan: March 8th, 2017 under Family, Susan. When Isaac was born, I totally bought into the stories I heard about women getting back to running shortly after they gave birth. One co-worker claimed his mom was back running the next day. I thought I should be able to get out there and run as soon as I could, especially since I had run throughout my pregnancy, up until I started having contractions. Partly, I admit, in an effort to get back to my pre-baby shape, and partly because it made me feel like “me” again. Of course the fresh air, endorphins and fitness were all important drivers too. There may have even been a competitive “badge of honor” aspect; I wanted to prove that I was tough and strong and committed to running. I was crushed when I tried to jog a week after giving birth, only to discover my groin was weak, my legs felt heavy, my middle was floppy, and my body didn’t respond the way I thought it should. I took what I thought was a slow rehab-style path to ease back into running, walking and gradually increasing my mileage over the following weeks. Over the past four years I have kept running. I have run because I love it, not to race or PR or go after any particular distance or milestone. I know my abdominal muscles are much weaker than they were pre-baby, which affects my speed and my stamina over long distances. I also have the urge to pee more often when I run, which got much worse when I got pregnant the second time and found that I either had to stop every mile or two, and/or struggled with leaking, especially when I ran downhill. I realized that I love running enough that I would keep running even if I had to wear pads for every hard workout, but I also took it as a sign to get some help in strengthening my pelvic floor so I didn’t have to make that choice. Fortunately, I found an excellent physical therapist who specializes in the pelvic floor, and approached treatment holistically. I also met her with a willingness to honestly answer questions about my bodily functions and sensations, and openness to go through the assessment process. Within about six weeks of starting the therapy work, I could run 3-4 miles immediately after emptying my bladder without issue. But I was also advised to take it easy and not put added strain on my pelvic floor, which was already stretching and trying to hold up 20 lbs of baby and accoutrements in my abdomen, by doing a lot of bouncing. I listened, and opted to run every other day or even just a couple times a week on flat soft surfaces. The PT also advised that I come back a month after birth, and not run during those four weeks. That seemed like a pretty long time to wait… and I admit I did go out for a few miles a couple times… but again I listened and didn’t start any major mileage or training between Ezra’s birth and my appointment. Maybe it’s because I’ve read and learned more about physiological changes that happen before and after pregnancy and birth, and I now recognize that it takes months for even a healthy body to recover. Willing the process to go faster does not change the fact that a body has a certain elasticity, and that pregnancy and breastfeeding come with hormonal changes that exercise doesn’t alter. I still want to be able to fit into my “normal” clothes but I no longer believe there’s something wrong with me if I am five (or, I’ll be honest, 10) pounds heavier than my pre-baby weight by the time I go back to work. Maybe I’m more thoughtful and in tune with my body, so I know when I’m pushing it, even if it doesn’t seem like what I’m doing should be that tiring. I’m certainly inspired by an incredibly talented and dedicated friend who is running PRs in her mid-40s, so I believe that my best running could still be ahead of me, as well. All this leads to my decision not to be running right now. There’s no reason to rush back before my body is ready. As our amazing dentist (she’s done 12 Ironman triathlons and has logged well over 1800 racing miles!) reminds me, running will always be there. Instead I want to take this time to build a solid foundation of strength from my inner core and also work on my discipline – yes it actually takes discipline to focus on these subtle exercises, much harder than to crank out crunches or reps of bicep curls or go run 3 miles. I hope that this decision and process will lead to better overall health, more enjoyment of the present, and ultimately better running through this decade and those to come. I still want to run the Indiana Trail 100, and I know I have a sub-3:30 marathon in me. I might even find myself doing a triathlon in the future. I’m in it for that dream of renting an RV to travel and do races around the country with Brian after retirement. These goals require a long view of health and fitness. So, because I love running and want to keep doing it for a very long time, I’ll walk out the door wearing a baby to take my son for a hike or bike ride. The running shoes can rest… for now. Posted by susan: November 5th, 2016 under Fitness, Susan. Ezra Wilson Judd was born on Friday, September 23 at 5:46am. He was 6 lbz 8 oz and 20.25 inches long. We welcomed him at home; here’s the story of how he entered the world. As previously posted, we were eagerly awaiting the time when our baby would decide to be born. I’d had a few contractions here and there, but nothing resembling the onset of labor. On Thursday, I went to work as usual, but noted that I was having contractions every hour on the half hour. I only had one meeting planned, a telephone call in one of the labs, and was happy to be at a standing desk where I could move around, stretch a bit, and basically not have to sit for a couple hours. I did a little extra tidying up at the office and got home for dinner at 6:30pm. I gave Isaac a bath and tucked him into bed, then headed downstairs to answer some emails and update my “Transition and Re-entry” plan for work, deciding to work at the counter where I could stand and move around. Kim had told us that for many second time moms, labor picks up after the older child goes to bed. She was right in this case! I started having contractions three times an hour, then every 10 minutes or so, and started recording them. Realizing that the train was gaining momentum, I sent my boss a few more updates and let some co-workers know not to expect me at work the next day. I’m sure lots of working moms use the first few hours of labor to finish up work stuff, right? I also got out the “when to call” information sheet and reviewed the labor/birth position handouts from Kim and Regine. Around 10pm I texted Kim to let her know that contractions were about 10-20 min apart and increasing intensity, hoping to catch her before she went to bed to let her know I’d probably see her tomorrow. (Little did I know at that time that Kim had just attended another birth, and Ezra’s would be her third birth in 24 hours! So her message to the other midwives was “hurry home and get some sleep, Susan’s next!”) I also let Brian know that I was doing fine but would likely need him to be “on” within an hour or so. I tried to go to sleep but got up with each contraction to get into a more comfortable position – mainly standing up, leaning on the wall or bed – then I’d crawl back into bed for another 10 minutes. I would jokingly say something like “see I can still talk through them!” to prove I could talk through the contractions, but by 1am they were about 5 minutes apart and not conducive to conversation. I asked Brian to call Kim back. Brian put her on speaker phone so we could both talk, and after she listened to me have a contraction through the phone, she immediately said “I’d like to come over, and I’d like Joyce and Dina to come with me.” The midwives arrived around 2am when contractions were 3-4 minutes apart. They started setting up their things – I recall welcoming them and hearing them boil water to sterilize some equipment, organizing their bags, and laying out some items on a cookie sheet, but mostly I paced around the kitchen and dining room, then went into the TV room to lean on pillows and labor quietly. I recall being hot and cold, one minute putting a cool wet washcloth on my neck, the next grabbing a fleece blanket. Even with ujjayi breathing I was starting to say aloud “I just want a break this time….” when a strong contraction would come, so I immediately took them up on their offer to fill the birthing tub, and Brian went up to help. 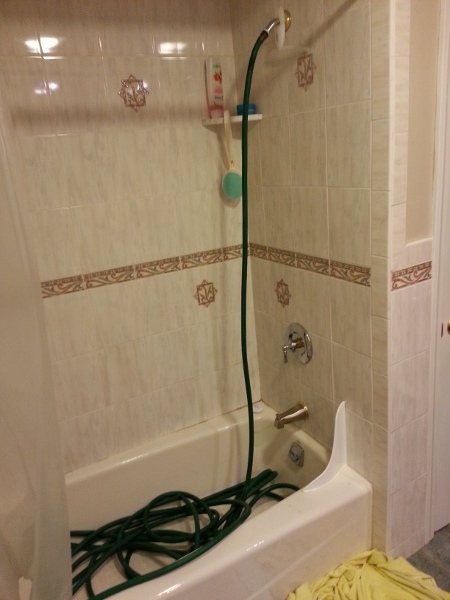 We were much more organized this time (compared with the late night impromtu plumbing for my labor with Isaac); the on-suite bathroom shower had already been plumbed with a new hose weeks ago, but there was still some discussion of an adapter to hook it to the tub. I moved upstairs and labored in our room, again leaning on the bed or walking around. I leapt into the tub – ok, just kidding, I gingerly stepped into the tub – once there were a few inches of water in it, and helpfully let them know when the fill line was reached. Whereas last time I sort of sat and floated, this time I wanted nothing to do with sitting. I stayed on my knees and hung forward over the side of the tub or reclined on my side, sometimes going onto hands and knees. I thought I heard Isaac snoring, and chuckled, enjoying the quiet, and knowing others were sleeping. I also reported to Brian that the tub had a “no diving” warning on the bottom. Who dives into an inflatable 2-foot deep birthing tub?? (and can read the warning?) I guess the legislators thought it better to be safe than sorry. Otherwise we all pretty much hung out for an hour or so, and I got the respite I needed. I started to get concerned that things weren’t progressing, though, so I tried squatting in the tub to open my pelvis more, and even though I didn’t want to get out of the tub, when Joyce asked when I had last used the bathroom, I thought it was a good idea to get out and try to pee. Gravity, it turns out, is a great accelerator of labor. It was like moving the labor intensity from a comfortable 4-5 up to a more jarring 7 or 8. I sat on the toilet but didn’t have anything to add, because I’d already vomited a few times downstairs and while I’d been sipping water, I am sure I was panting out or absorbing all that was in my system. In another moment of levity, as I was starting a contraction on my way out of the bathroom, I realized that whatever contents of my stomach remained would not be there much longer, and quickly told Joyce (sitting on the toilet seat, encouraging me to breathe and relax) “turn around!” which she somehow interpreted correctly as a warning to get out of the way. In my mind, it was a slow-motion ninja move whereby she stood, straddled, and stepped to the side (no easy feat in our small bathroom) while I twisted around, knelt, lifted the lid and heaved. “Sorry about that.” “No problem.” And on we went. When I did get out the bathroom, they invited me to try the birthing stool. At this point we didn’t think my water had broken, but there was a lot of pressure downward, so I bore down thinking I was trying to break the amniotic sac. It made sense to have a supported squat position and handles, but the position didn’t feel very good, and based on the frequent checks of baby’s heart tones, the baby wasn’t a fan of this position either. So Kim recommended that I get up onto the bed. As much as I was happy to get up off the stool, I didn’t relish trying to get into bed, and in the back of my mind I knew that it would be harder to move around. It took me a few contractions (time in my memory was measured by contractions at that point) to take the half-dozen steps over to the side of the bed, consider how to get myself up there, and then actually climb up, despite having Brian right there to help. Once there, I rested (ok, maybe it was more like “flopped”) on my side for a bit, then settled into a position on my left side (facing away from everyone so I could focus), holding Brian’s hand so I could squeeze it, with a midwife supporting my right leg. Kim coached me to pull my knees to my chest and bear down during contractions, and gave updates on progress. Once the head was in sight, I felt like I was in the home stretch, and just kept going. It seemed like I was pushing for about 20 minutes, but Brian reports that it was over an hour. I distinctly remember the head emerging, then being out, then a pause to adjust, then the rest of the baby sliding out. Relief! Elation! We have a baby! And there was laughing and cooing and crying all around. All this time Isaac had been sleeping in the other room. When he heard the baby’s cry, he emerged and seemed to know instantly that something was going on! He came in and met his brother, and even got to cut the cord. He’d been fascinated with umbilical cords for months. First, when I explained that my “outtie” was a hernia, and not the baby itself, and no the baby would not be coming out of my belly button. Then learning that the baby “eats” and “breathes” through the umbilical cord before it’s born, then seeing pictures from Being Born where he’d point out the baby’s umbilical cord. So it was very fitting and sweet for him to help Kim with this part of the process. The next hour or so was a blur of Brian taking Isaac downstairs to play, the midwives helping me deliver the placenta and taking care of me, checking out baby, the midwives cleaning up (Dina also quesitoned the “no diving” warning on the tub! ), and reflecting on the birth, because I was so focused on holding Ezra and starting to nurse him. They brought me breakfast in bed, warming up some waffles Isaac and I had made (we keep a bag of leftover pancakes and waffles in the freezer for quick toaster breakfast – perfect for having just had a baby!). I thanked the midwives for their help and support and work and being up all night with me. I always felt supported and encouraged and informed throughout the birthing process, and I can’t even describe how nice it was to be in our own home, to be tucked into our own bed. Having a home birth was empowering and felt natural, plus it resulted in a very healthy baby and a fast recovery for me. Posted by susan: October 2nd, 2016 under Little Juddmansee, Susan. It’s been an interesting month of waiting. My Estimated Due Date was September 5 (the Ob/Gyn practice calculation indicated September 4 or September 6, so we split the difference and adopted the obvious date of Labor Day at our first appointment back in early February). Because this was a second pregnancy, many family members assumed this baby would arrive early. And with Brian and Isaac enjoying a pre-school and pre-baby trip to Florida in August, the well-meaning check-ins started early. So now that it’s September 17, I’ve been on “any day now” mode for more than two weeks. And this week, my clock reset for another two weeks. Fortunately we have a terrific midwife and birth team who attended my labor with Isaac and have been helpful, informative and encouraging the past 20 weeks. This week, after a normal checkup, Kim suggested that even though things are probably fine, maybe I should get an ultrasound biophysical profile just to reassure ourselves going into the weekend that baby is still thriving. She scheduled an appointment with Shaila Associates; we can’t say enough positive about the experience there. The sonographer was friendly, gentle, explained what she was doing at each step, answered questions, cooed at the baby, and even cracked a few jokes. She was patient with the extremely active twisting and moving baby who managed to get hiccups in the middle of the process, making it even harder to get all the measurements and readings! In addition to passing the screenings for amniotic fluid, placenta health, umbilical cord blood flow, movement (is there extra credit there? ), practice breathing, heart rate, and muscle tone, she also took measurements to estimate baby’s size. While certainly not exact (plus or minus 1 lb) and much more dependent on genetics than developmental stages that are more easily seen in early ultrasounds, the baby seems to be around 6 lbs 9 oz, and shows no signs of being “post-term.” This was the most interesting part, and got us thinking about that Estimated Due Date. Unlike my first pregnancy, my fundal height has been smaller this time, which we attributed to the baby being transverse. When we hold up the “your baby’s size this week” drawing, it always seems a little bigger than I am. There has been plenty of room for baby to move around, when it should be getting pretty tight in there by now. And while I started early labor contractions with Isaac almost a week before he was due, I didn’t have any before September 5, and have only started having a few occasional contractions the past few days. I didn’t keep detailed notes on “important dates” in December, but with Brian and I comparing notes, we came up with an alternative scenario that would place the due date at today, which seems consistent with the other evidence now that we put it all together. We are now chalking this one up to mis-calculated due dates and resetting the clock. So, all around, we are relieved to have the ultrasound and data reporting a healthy baby and we’re back to waiting to see when it will decide it’s time to appear, realizing that it could be any time in the next two weeks. We’ll keep waiting. In the mean time, I’m not sure how to adequately describe what it’s like for each day to feel like it could be “it.” At work, I have only taken on tasks I can finish that day, or within a few hours (knowing that if I go into labor, I would be able to make a few phone calls or send one more email and turn on my Out of Office message), or that can wait until after I return from leave. At home, things have been ready for over a month. The nursery is set up, wall decals arranged, clothes and diapers washed and put away, and birthing kit assembled. I even packed a hospital bag that includes clothes for me, Brian and baby – unlike last time. Today we cleaned up the play room and sun room, and I scrubbed the kitchen floor. We’ve stayed caught up on laundry and dishes. We have our short list of names ready for when we meet the baby. There is gas in the car and food in the fridge. Still waiting…. practicing patience, and trying to treat each day as a bonus to spend as a family of three. Posted by susan: September 17th, 2016 under Little Juddmansee, Susan. If you just want to see the pictures, click here! We had a hearty continental style breakfast including our first picked whitefish (yum!) along with more muesli and yogurt. There was fruit and pastry and boiled eggs as well. After fueling up it was time to hit the road. We debated taking the ferry from Stykkisholmer but the drive was the same length so we decided to drive and see the fjords. (foreshadowing). The first dirt road we were on was quite muddy and bumpy but pretty straightforward driving. By this time, we had calibrated civilization. Any group of 3 or more buildings was “town,” or any intersection or stopping point with a petrol station/small convenience store and a guest house (sometimes a home with an outbuilding, maybe 5 or 6 rooms) was a notable spot on the map and guidebook. Most had “cakes” that we came to understand as any type of pastry, mostly danishes (from the Danish influence), made with either wheat or oat flour, and some with rhubarb or nuts as a filling. We later discovered one tasty item we tried was called “Happy Marriage” – an oat bar with jam. Arugula, peas, lamb and fish were plentiful, but most other provisions were imported. A few types of green-house grown vegetables, such as tomatoes, could be grown locally using the plentiful summer daylight and geothermal heating. It was best to not worry about the cost or exchange rate and just get whatever sounded best, since everything was very expensive compared to the US. Upon making it to the north side of the peninsula we turned onto another dirt road. This one was being re-graded which narrowed the road to one lane. On trying to pass the grader, we slid sideways and got stuck in the soft dirt on the side of the road. I was unable to move the car. Fortunately the road was fairly busy and a car with 3 young men stopped to help us. As we were debating the best approach, a tour van driver who saw us slide off hopped out, barked some instructions, and had us back on the road in short order. The whole thing probably took less than 10 minutes but it was a little more excitement than I was looking for. A little more dirt road and we were back on pavement. We stopped at a town which had an N1 (petrol) station. I figured out how to buy a petrol card since many of the stations around the country are unmanned and US credit cards (which have no European style PIN) do not work. The station was also a grocery store and sold appliances. Kinda the main store for the whole “town” of approximately 1000 people, and reminded me of the store in Herscher, IL near our cousin Eric. One or two units of a variety of standard items (like frozen fish, packaged dinners, a small array of meat, lots of kinds of yogurt and cheese, and an aisle of pasta and dry goods that could be reonstituted when boiled for a quick meal or camping), but very little produce. We were lucky to find some bananas and an apple and plums, picked up some fig bars, and a yummy Skyr yogurt drink and got back the road. Our next destination was a major waterfall about 2.5 hours away. As we left town we quickly started ascending and had some great views of flowing rivers. There was no rain so visibiity was much better than the previous day. We stopped at a small waterfall to take some photos. Along the way, we saw plenty of sheep. Most were mothers accompanied by two lambs, and the two lambs were good about running to mama when cars approached. At one such instance, a confused lamb ran into its sibling and mounted it in the road instead of getting out of way. Silly lamb! Finally they both cleared the road and we moved along. Then we kept ascending and descending. Then the roads turned to dirt. Then we were driving on a narrow road along the walls of the many fjords. Climbing one side, heading over the summit, and then descending the other side. We headed up each valley, usually crossing a one lane bridge where the glacial river emptied into the fjord, then heading back up the wall of the opposite side of the fjord. It was challenging driving. We finally got back on some pavement at a small gas station/restaurant/swimming pool where the road split to the waterfall and the other way to our hotel. We decided to go to the big waterfall called Dynjandi (good decision). It was another hour of narrow dirt road but this time the scenery was not fjords, but instead a rocky open landscape with very little plant life. There were still snowpacks in the north and west facing cliffs and glaciers in the distance. It was much more brown (and red from iron in the soil). Finally we descended to the falls. One huge main head fall about 1km from the road descended several hundred feet to a series of smaller falls (all named) that emptied into the ocean. Unfortunately this was our first encouter with bugs – there were swarms of small flies. Brian took lots of pictures, and Susan was glad they had a WC at the parking lot. Never take petrol or bathrooms for granted in Iceland. Also refill or unload (or both!) each time you see one. After walking around the falls and enjoying the invigorating mists, we headed back over the dirt road to the gas station and filled up again (with a WC stop and another oat “cake” for a snack) before heading toward the hotel. Halfway to hotel the road turned to dirt. We saw a sign advertising a bar and big screen TV showing soccer so we decided we would eat there rather than at our own hotel. We considered a nice bistro in a fishing village across the fjord, but it would have required an extra hour of travel and I was tired of dirt roads. We checked into the hotel, which was a former boarding school. Our bedroom was a dorm room with an updated bathroom. The bed was also very comfortable (individual duvets again). Su took a short nap and we headed the 10 minutes down the dirt road to the next hotel for dinner. Due to the continuing rainy weather, bad visibility and being tired of driving we decided to change Sunday/Monday plans. We booked a spot for the car on the ferry back to Stykkisholmer so we wouldn’t have to drive the winding mountain roads farther north, and then a long drive back on Monday. It was fun to do once and great scenery but I didn’t need to do it again so soon. At this point we did not have a hotel for Sunday night but figured we would be able to find one. Su picked out some things to do in the rain Sunday (explore town, go to the swimming pool) near Stykkisholmer, which is a huge town of 2000 people. Dinner was just ok (fish and chips for Brian, shrimp fettucine for Susan) but we were ravenous. After dinner we both wished we’d tried the grilled salmon and vegetables, maybe next time. We were joined at dinner by a large group of motorcyclist who were staying at the hotel’s block of rooms in a second building. They were enthusiastic but polite, and it added an air of energy to the dining room. The site also had camping in addition to outbuilding and the main Inn. After dinner I watched a few minutes of soccer in the bar before heading out to the evening entertainment – the Latrabjarg bird cliffs. We discovered that after dinner is the best time to go see Puffins, and with daylight extended nearly all night, there was no reason not to head over. It was a 30 minute drive on narrow dirt roads (again!). The car by this point was filthy and I was exhausted from driving. The bird cliffs are the westernmost point in Europe (not counting the Azores). Thousands of black birds (terns and other varieties of sea birds) and gulls nest on the cliffs. We managed to see 3 puffins, cute friendly quiet little birds compared with the others, and I again took many photos. The ground was amazingly soft and it was so quiet other than the crashing ocean and birds. We walked about 1km up the cliffs before turning around. We came back down to car and read about a famous shipwreck and heroic rescue by the townsfolk before heading to our hotel. At this point it was 2200 and the sun was still in the process of “setting.” The sky would have maybe turned red if we had stayed until midnight but we were sleepy. Posted by brian: June 30th, 2016 under Brian, Fitness, Hiking, Susan, Travel, Us. Posted by brian: June 29th, 2016 under Brian, Hiking, Susan, Us. Today I met up with a friend for a Turkey Trot in Acton. My plan was to run with my friend and see how long I could hang with him. But since he was running with a stroller, and etiquette requires strollers start at the back of the pack, I ended up switching plans at the starting line. I was also unable to find my usual “pace pack” – no one admitted to actually having a race plan, they were also just planning to have fun or “see how it goes.” Having done a negative split, 7-mile run last weekend that culminated in 7:30s, and consulting with Coach Brian before I left, I figured I should target a 7:30 pace. It was actually hard to go out fast. The voices behind me were chittering about “no reason to sprint” and “let them go ahead” and “we don’t need to start to fast.” I’m sure I cued into these voices as they echoed what was in my head – I’m used to holding back, pacing myself, saving it for the end. But part of my goal in racing 5Ks is to NOT hold back – remember my Jan 1st goal? Still working on it. I kept telling myself it’s only a 20 min race, and I’m not known for my kick at the finish line so I might as well leave my effort out on the roads. I immediately started picking off people and I felt very solid at the first mile, coming in at 7:46, so I kicked into a faster gear for the second mile. I kept asking myself “can you go faster?” I liked running the hills (albeit small ones) hard and I always was able to pass people on the downhills. I tried not to let myself get focused on the next person ahead of me, but instead focus on someone even farther ahead whom I could reel in. I pulled out a 7:24 second mile and then sped up just a bit more as I found someone to pace with in the last mile with a few surges. I finished in 23:19 (unofficial) – a 7:29 pace. Reflections: A longer warmup is definitely better. I felt good from the start, I certainly didn’t feel like I tired myself out, and it was nice to spend 20 min away from the crowds that tend to make me nervous. I can definitely challenge myself more. Next time I should target a faster just to see if I can do it – maybe part of the reason I feel like I’m at a fitness plateau is that I’m not continuing to push myself. I don’t think I can sustain a 6:30 pace like I did at the end, but a 7-7:15 pace still seems comfortable. I like running with other people. I didn’t feel particularly nervous about this race, so maybe that part is getting better! And I really need to figure out how age group awards work. I suspect I may have been top 3 in my age group but I was getting cold, I didn’t see any activity or organization indicating awards were imminent, so I decided to head home. I look forward to seeing the results when they are posted. Addendum: Hey, I won my age group! Cool! And I was pacing off a 14 year old for mile 3. (Wow, I’m soooo old.) But I have to say, those Marx youth team members are inspiring! We’ve seen them at several local races in their fierce orange jerseys. Posted by susan: November 28th, 2014 under Fitness, Susan. Today is Mother’s Day, carte blanche to do whatever I want, right? So I started by waking up at 5:30am to participate in the Walk for Peace, meeting up at church to carpool into Dorchester. On our way, I saw the Mother Teresa church, a homage to one of one of the world’s most well known peacemakers, which started my mind on the transition to navigating an unfamiliar area in a different context. As we walked through the neighborhoods, I chatted with other church members, and initially tried to stay tucked into our “pack” behind the First Parish Chelmsford sign, while trying to navigate a stroller around the crowds and potholes. But after a while, I was able to let go of trying to stay close to the rest of my familiar group. As our Religious Education director reminded me, part of the day is to mingle with other people, start up impromptu conversations, and observe. We continued along the route as residents sat at their windows or on porches, many seeming unsure what to make of the 100s of people meandering along the street. We waved and smiled, especially at the mothers and the children. Cars passing by honked their horns in support. I wondered how many people felt it ironic that a peace walk was loudly interrupting their morning quiet or blocking traffic along their way. I didn’t feel like joining in on the bullhorn call-and-response of “what do we want?” “PEACE!” “when do we want it?” “NOW!” because peace, to me, is more quiet and introspective, not something to be demanded. But to many of these people, peace is something they actively strive to foster on a daily basis, something they will shout and fight for. There were dozens of people wearing T-shirts and carrying posters with pictures of loved ones, lost too young, to violence. Some were victims of an attack or shooting, others the collateral damage of a broken life lived with guilt and sorrow that led to depression and even suicide. One speaker asked, responding to the familiar “RIP” next to the name of a departed loved one, “What about Live in Peace or Grow Up in Peace?” Some people quietly held signs advocating peace and hope as they walked along. A little farther down the road, the woman with the bullhorn changed up her questions, talking about the importance of forgiveness as part of working toward peace. I could listen in on conversations, observe the architecture of the buildings, think about the economics of the area. One block was full of Vietnamese signs, businesses and shops. Not far away, I saw a market advertising Spanish, Portuguese, Latin American and Caribbean foods. I thought about the different places that people came from, all living together in close proximity, probably bringing different ideas of culture, ethics, lifestyles and survival. I tried to recall how long it had been since I took the Red Line to explore a new area and felt really out of my element; I was glad to be able to come today with people I knew, surrounded by the crowds, and feel safe. So many churches, many of them housed in former auto-repair garages and store fronts, with friendly volunteers handing out water along the way. As we marched down one block, a fellow walker described the street as being one where shootings were common, and then recounting a story of when she was caring for children, and heard gun shots on the street. How they asked what the popping sound was, and what they should do. “We need to stay inside for now, then when the sirens come, we’re going to get out of here.” How she had seen a body laying on the street as the police arrived, and she ushered her charges home. Teenage girls recited chants in singsong voices that peace is possible, desiring peace in their neighborhood. Returning to the park, where dogs met one another with wagging tails, we reunited with our group, commented on the beautiful weather, admired my sleeping son, and made our way home to other activities in the safe-feeling suburbs. I was thankful for a few hours to be on the move, but with a quiet mind, meditating on the question of what I can really do to encourage peace, a question without any concrete answer. For today it is enough to bring my son to Dorchester, thankful that I have him, and hopeful that he’ll grow safely to adulthood. To be part of a movement of humanity, surrounded by others who put aside their other daily activities and priorities to literally take steps toward a more peaceful world, starting with a more peaceful neighborhood. Posted by susan: May 11th, 2014 under Church, Susan. On Saturday we ran a small local race, the Chelmsford Lion’s 5K, to benefit student athletic scholarships. When we arrived at 9am, we tried to park at the front of the middle school, only to find that the lot was a zoo! It was completely full, with overflow at the administrative offices also full, and all reasonable street (sidewalk) parking also taken. Hmm, we expected a low-key local event; has this race gotten much more popular since last year? So we drove around the block through a neighborhood (no good places to park) and drove around to the back of the school, where we saw a sign for 5K parking across the street from the track. It turned out that the wildly popular Chelmsford Mother’s Club tag sale was the same day, and it’s reported that you have to get there right at 9am to get the “good deals.” There was also a bottle and can drive at the back of the parking lot. No wonder it was crazy! Fortunately the back lot contained plenty of space and a much calmer air, as students and a few non-affiliated local runners like ourselves gathered at the track to register and warm up. I still had some nervousness, but was much calmer than most races. I think having Brian and Isaac around helped, as well as it being a much smaller race than I have done in a long time. It was reminiscent of high school cross-country races, with a little bit of catching-up with other runners, friendly banter about the course’s hills and turns, and general enjoyment to be out running on a beautiful morning. I did a few laps on the track to warm up and work out the nervous energy, went to check on Isaac and Brian at the playground, and then did one more lap with some pickups to get my legs moving. Without much fanfare, we lined up at the blue tent indicating the starting line, Brian with the stroller toward the back, and me running solo near the front. I had decided to run this event based on feel, and not use a watch. I wore the Garmin for data collection purposes, but didn’t glance at it once (which turned out to be hard to resist!). I just kept asking myself if I could go harder, and listened to what was limiting – catching my breath, leg turnover, muscles, mental state? When the horn went off, I took of at a sprint like the rest of the front runners. It was fun to tear out of the parking lot and down the road. After about a quarter mile, I settled in, checking on those around me. A group of girls from Team Run (affiliated with the sponsoring running store) were leading the pack, and I was a reasonable distance behind. I tried to keep tabs on the top women other than the youth team, and felt like I was probably running around 3rd to 5th. I ended up pacing most of the time with Alex, a super kid with amazing talent – can you believe he’s only 8! I towered above him and felt bad several time when I was literally breathing down his neck. I’d pass him on the down hills, while he had an edge on me when going up hill (size and I’m just not in hill shape yet), exchanging a few words of encouragement here and there. Mostly I was breathing too hard to talk and be social, even though there were several other guys running about the same pace as we were. A 5K still seems to go way too fast. There’s no settling into a pace or clicking off the miles – it’s go out hard, try to stay focused, and finish strong! It was easy to know how far we had left when we started cruising back up the road, and once we entered the track, there was 300m left to go. I had been closing on another woman in my sights, and thought I might be able to catch her with a burst of speed. Unfortunately, speed has never been my strong suit, and this day was no exception, so I wasn’t able to catch her, and in fact got passed with about 100m to go by another woman despite a pretty good push at the end, at least for me. I finished in 23:11, almost a minute faster than my last 5k, and sub 7:30 pace. Improvement is good! I walked through the short chute and grabbed a water, tried to catch my breath, and turned around to see Brian and Isaac finishing right behind me! Brian was going to take it easy, but evidently he was feeling spunky with the stroller, coming in at 24:46. The full race results are here. Since they had age group awards, and it was a small race, I knew I had placed. So we hung out on the track, grabbed refreshments, and let Isaac run around to his heart’s content until the awards ceremony. The sun was warm and it was so nice to just be out among other local runners. Isaac decided to get in his own workout, so cute to see him on the track! If you can’t see the video below, here is the link: Isaac running track! Posted by susan: April 14th, 2014 under Brian, Fitness, Little Juddmansee, Susan. We decided it would be an excellent idea to do a 5K while we’re in FL on vacation. Brian and his sister are running a 5K per month, and this was a chance to run one together. It’s been too long since Sarah and I have signed up for a race together, too (longer ago than we’ve had this blog!!). 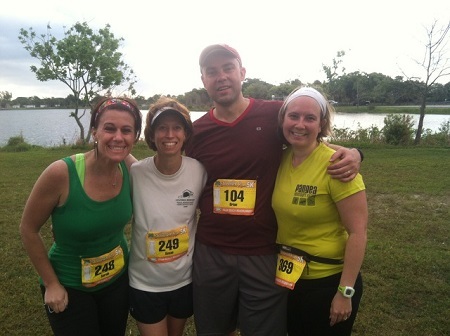 So Leslie recommended the Shamrock 5K at Lake Worth, and all 4 of us decided to toe the line. No need to beware the ides of March in this case, as we all had great races and a lot of fun. There were about 500 runners in the 5K and another 500 in the 10 miler, so a fairly large number of people were pulling into John Prince Park as the sun was starting to rise. It was a relaxed but well organized race with plenty of facilities, space to warm up and stretch, and of course awesome weather. Many of the Floridians were wearing their long sleeved, bright lime race shirts, but our group opted for short sleeves or tanks. With a race time temperature of about 70 degrees, it was pleasantly warm, with a slight drizzle that seemed to evaporate as soon as it touched our skin. We decided to each run our own race. Leslie knew the crowd, found a spot at the start that felt comfortable for her, and avoided some of the weaving. Brian, Sarah and I all paced closely together for the first mile, weaving through the crowd (despite Leslie’s suggestion that we should move up at the start line. Lesson learned.) The course was along a recreational path along the water, really pretty with plenty of turns to keep it interesting. The crowd was a little congested at the start, but after the first mile it was mostly single file, with enough people to have someone to pace with you, or someone just ahead to target for passing. As Brian predicted, I went through the first mile at a 7:45, with Brian and Sarah a few seconds back at sub-8s as well. I held on for a 7:45 second mile, and stuck to nearly the same pace with a 7:48 3rd mile and 44sec last .1 for a 24:03. I heard a spectator cheering on a woman just ahead of me, telling her she was placing in her age group. And she looked about my age. Sure enough, 3rd in my age group was just 5 seconds ahead of me. Lesson #2, don’t forget about being an “age grouper” now, those few seconds of weaving or loss of focus can count! Brian came through shortly after in 24:21, with Sarah right behind at 25:23. We had just enough time to walk back to the 3 mile mark and see Leslie coming through, so we could cheer her through the finish too. We did a leisurely cool down, stretch, and snacking before heading back to the car. It always feels good to have done a race and have your whole Saturday ahead of you at 9am! I had not run a 5k in a very long time. It is just as short as I remember it, hardly time to get into a groove before the race is over. It’s all about starting out hard and pushing yourself the whole way. My limiting factor as this point is that my core muscles still have not recovered from pregnancy/childbirth, so getting them toned up will be a focus for the coming months. I also experimented with caffeine, which I have not really had since February of 2012. I had nearly a cup of coffee before we left for the race. It was hard to tell if I was affected by normal race butterflies or if the coffee caused a bit of distress, but I don’t think I’ll be resuming consumption of regular coffee again quite yet. Overall, a really fun day, I would definitely come back next year, and maybe try the 10 miler! Posted by susan: March 15th, 2014 under Brian, Fitness, Susan.